As much as people who were watching the shutdown of the foreclosure reviews expected the payouts to be grotesquely low, seeing the actual numbers is….revolting. As readers may recall, borrowers who were foreclosed on or had foreclosure actions underway were given the opportunity to have foreclosures completed or underway in 2009 and 2010 reviewed by “independent” consultants. 510,000 borrowers submitted letters. But the process was shut down, with hardly any reviews completed and the ones that were done highly suspect, given that multiple whistleblowers (and not just ours!) reported the banks and reviewers were colluding to suppress any finding of harm. This is part of the OCC’s payout matrix (click to enlarge); you can see it in full here. The numbers here beggar belief. They are seriously trying to claim only 8 people who submitted letters were foreclosed on who had made all their payments on time? I’m going to check with my Tampa Bay whistleblowers on this one, and I am highly confident that my seven sources (out of 900 temps employed at that site) saw more examples than that. An even more obvious howler is claiming that only 239 people weren’t converted to permanent mods after completing three payments under a trial mod. The temps reported that borrowers were kept languishing seven, ten, even as long as 18 months in a trial mod while the bank kept receiving but pretending it hadn’t gotten their required documentation (the temps also reported seeing images of the documents that had been faxed in yet were claimed to have gone missing). Even though, as Shahien Nasiripour points out, the aggregate numbers ‘fess up to large levels of mistakes, they’ve all been conveniently shifted to the less consequential categories. 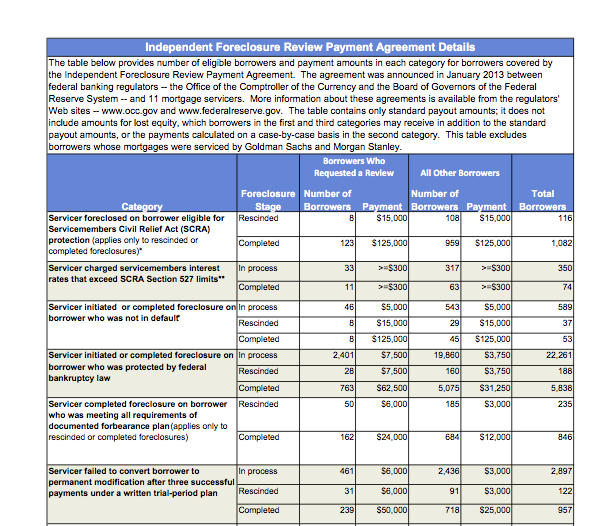 For instance, you’ll see in the columns that show letters sent to the IFR, the absurd claim that only 8 people were foreclosed upon while 46 had foreclosures “in process”. Ahem. This appears to reflect the fantasy that banks would catch their erroneous foreclosures or would halt the process if the borrowers provided proof of payment. But as anyone who has been on this beat knows, getting servicers to rectify errors is pretty much impossible, particularly once a foreclosure is underway. So the numbers have clearly been doctored to reflect bank PR. Remember the lengths the “independent” consultants went to to deny that anything bad happened. One of our Tampa Bay witnesses recounted how Promontory argued that a borrower had not been harmed when his payment checks were sent back by the servicer: “the bank was sending back payments because the borrower was not making any.” Huh? What is the point of sending $300 to 2.4 million people? Under what scenario does that accomplish anything? The banks spent over $10,000 a loan in the IFR so that they could send the borrowers $300? The servicers don’t even get a release from liability in exchange for the payments. About the only thing that seems to have been accomplished is that the IFR was stopped before higher borrower losses could be uncovered. Even by the sorry standards of the earlier Treasury Dept shams, this is particularly lame. Those affected by foreclosure mistakes questioned the fairness of the payouts. Eric Krasner, 52 years old, of Duluth, Ga., filed for bankruptcy before losing his Frederick, Md. house to foreclosure in 2010, a mistake that should mean a payment of $62,500 according to the regulators’ compensation schedule. Mr. Krasner, who had a mortgage of $365,000, filed for bankruptcy after a gift shop he owned sunk under the weight of the recession and wound up losing his home. If the “bulk of people get $500 or $800 after losing their houses, is that making good on things?” he said. But Promontory and other consultants are now facing scrutiny in Congress, amid growing unease over their influence and their close ties to federal authorities. The Senate Banking Committee is set to hold a hearing on Thursday to examine whether regulators inappropriately “outsource” oversight to consultants like Promontory, which are paid billions of dollars by the banks…. Banks are also privately raising concerns about Promontory and its steep fees, which can total as much as $1,500 an hour, according to people with knowledge of the matter. Bank executives, who were not authorized to speak publicly, said they sometimes hired Promontory to appease regulators, who think highly of the firm’s expertise. If banks, who are used to paying big ticket M&A fees and not-shy-about-charging consultants like McKinsey are choking on Promontory’s fees, you know something doesn’t smell right. They don’t think they are getting the value, yet Promontory’s dominant position leaves them feeling they have no choice. Mr. Ludwig has occasionally invited Fed governors and other top officials to parties at this 13,000-square-foot Washington home, an $11.5 million estate replete with a tennis court and a modern art collection. Mr. Ludwig, a former executive at Bankers Trust, is also a regular at the Four Seasons restaurant in New York, where he is known by name and salad order. According to people with knowledge of the matter, Mr. Ludwig regularly travels by private jet and earns more than $30 million annually, making him better paid than top executives at many big banks. He has shared some of his fortune with a range of philanthropic causes, including the National Academy Foundation, Yale Law School and community groups like the Neighborhood Assistance Corporation of America. Through Promontory and other companies, Mr. Ludwig has a vast reach, overseeing a private equity firm that invested in struggling banks during the financial crisis and another business that helps banks bundle mortgages and other consumer loans. He also started the Promontory Interfinancial Network, an independent firm that splits up companies’ large bank deposits into multiple $250,000 chunks so that the F.D.I.C. will insure the cash. The business processes more than $1 billion a week in customer funds, according to court filings. I strongly suggest you call or e-mail Sherrod Brown and other members of his subcommittee to express outrage and suggest questions. His hearings are scheduled for Thursday. Please also campaign for hearings in the House. Maxine Waters, who is the ranking member of the House Financial Services Committee, has asked for them, and public pressure would overcome Republican inertia. The most important targets are Jeb Hensarling, Scott Garrett (Capital Markets/GSEs Subcommittee Chair) and Randy Neugebauer (Housing Subcommittee Chair). Wells Fargo admitted in bankruptcy court in Louisiana that its systematically overcharges borrowers in bankruptcy, and decided to pay punitive damages rather than fix its accounting. That contradicts your finding that “few borrowers were being found to be harmed.” How do you square those two statements and how will you restore public trust? Is it harm if a foreclosure has been reduced to judgment, but the bank doesn’t take title, so the homeowner (who thinks they lost the home) is still on the hook for property tax and is pursued by the municipality for the taxes? Was that harm part of the IFR? Why not? Against such a backdrop of documented recklessness, do you believe it plausible that very few borrowers were harmed by the way banks conducted foreclosures? Fannie Mae/Freddie Mac have been performing formal, systematic audits of the foreclosure law firms they hired to prosecute their foreclosure cases for years. Was any thought given to examining their audit process or results to determine what problems and issues they found? . In high foreclosure states like Florida and California, I would imagine the judges that hear thousands of foreclosure cases see systemic problems….was any thought given to contacting judges who hear foreclosure cases to determine what problems and issues they found? Was there any effort to reach out to lawyers that are defending consumers to find out what issues they assert plagued the process? The entire process was so front loaded with accountants and process firms, but the errors and problems were legal in nature, involving understanding and interpretation of laws, why was there not more emphasis placed on having lawyers providing legal opinions and analysis? You knew there were process problems ever since the OCC shut down reviewer Allonhill a year ago, after undisclosed conflicts came to light, correct? You knew there were staffing issues because the Allonhill conflict was in easy to find public records the OCC ignored, correct? Didn’t the Allonhill debacle prove the OCC staff wasn’t up to the task of hiring these firms many months ago? After assuming your new role, why didn’t you audit both the hiring process and price charts immediately? Since the OCC missed flagrant conflicts, and approved unconscionable price charts, isn’t it true they might also be misled on consumer harm? Please add more in comments. This entry was posted in Banana republic, Banking industry, Legal, Politics, Real estate, Regulations and regulators on April 10, 2013 by Yves Smith. most interesting find on the OCC website is this chart dated June 2012 which in many categories has payment amounts mirroring what the final payout chart indicates, without the numbers of “victims” of course. Tail wagging the dog much? grab a screen shot while its still there! There are more categories on the old chart, and look closer at compensation values. They are more generous, with two more categories qualifying for the $125,000 award, those who didn’t get permanent mods after successful trials, and those who were foreclosed while doing a trial mod. The borrower who was “not in default” category included those who were in default only due to servicer error and would receive $125,000 if they lost their home as well. And there are categories for lacking legal standing and lack of sufficient notice with remedy listed “as state law dictates”, as well as for having forced-placed insurance imposed while existing insurance was in effect. This older framework is more borrower-friendly and is a better representation of the issues encountered by borrowers. If the servicers thought that there were four categories that would result in $125,000 awards, based on the OCC’s framework from June 2012, that would explain why only 239 borrowers were found in one Yves pointed out, those not converted to permanent mods after making all trial payments. I strongly suspect that the consultants were under pressure not to find borrowers in the most pricey categories. I want the OCC to take notice regarding the people that after losing their home committed suicide, giving $300.00 to their families wont to anything.Have did ever consider them? Did they ever took notice of that? When the OCC was the OTS banks that had closed or who were closing commercial operations were allowed to continue to generate mortgages. They did not have commercial location and could not be contacted by customers. The list of companies can be found at http://www.thetruthaboutmortgage.com in the achive from February 2007. Mortgage Electronic Registration Systems Inc.(MERS) was associated with most if not all of these companies. courts in New York have determined that all transactions associated with MERS are illegal because the mortgage was separated from the note. MERS installed themselves and HSBC as benificiary on both the note and the mortgage. The note was recorded the mortgage was not. Dummy companies were used to generate and refinance mortgages putting rediculous terms on the contracts that could not be satisfied…ajsanford-honestyproject.org. Its so frustrating to know the consultants were paid $250-$1000/hr and the victims of the abuse get $300. I knew it was going to be a ripoff when I heard the review would be stopped for a settlement. The Big Banks win again. I believe the review was just that, a review. Find the problems and they will fix them, just like the fixed everything with fraudulent documents. I am sure it pains them to send out those $300 checks. Chris Hayes did a segment last night on MSNBC on this with Alexis Goldstein from Occupy SEC, Eric Schneidermann, and a homeowner who lost her home after putting down 20% in 1986 in CA and falling behind $12K, refused a mod. She said she was getting $500, didn’t think it was fair that the consultants on her loan would get $10K, or that they got $2B and all the homeowners $3.8B, but otherwise she almost sounded like she was running PR for the banks. Eric pointed out that the total settlement was less than GS got in the AIG bailout, and reminded viewers that Holder thinks TBTF is TBTJ. Alexis did an excellent job of summarizing what happened, including pointing out that OCC is a corrupt regulator that sides with the banks and should be eliminated (Eric agreed, said he’d tried three times since 2004 to force OCC to intervene with mortgages and had failed). Alexis said the IFR was a pre-emptive move to prevent CFPB from doing an honest mortgage audit, set up a few months before CFPB was launched. I don’t like many tv pundits, who only occasionally get things right. But Chris Hayes is good, really good……. a true progressive. He gets different guests than you see on other shows. He’s had Alexis a few times. She’s sharp and articulate. I assume Yves knows her. We’ll have to get Yves on his show, I’ll work on that. :) He just moved from a morning weekend show to daily evenings at 8pm, took over Ed Schulz’s spot. I wonder how long he’ll last. Oh, I’ve turned down repeated requests to do his show because I couldn’t physically manage 8AM on a weekend (I’m up now only by virtue of being up all night) in general, and in particular when they asked (I was sick a ton this winter, REALLY sick like can’t leave the house sick). Evenings are much better so if you can remind them, that woudl be great. Yves, you are doing yeoman’s work on this issue. I personally thank you from the bottom of my heart. Yves, at the risk of seeming rude, I hope you don’t undervalue TV time. TV discussions are often vapid and some guests churlish, but even when it is hard to get a word in edgewise, every minute on the tube is likely worth 100 on this blog in terms of public opinion and public opinion is the coin of the realm. And yes, I wholly understand that impossible means impossible and working oneself to death can be unfortunately successful. I pray for your good health. It was Spitzer, not Schneiderman. I was impressed with Chris Hayes coverage too. Thanks for straightening that out. I was checking to see if the sun had come up in the west this morning. Yes, it was Spitzer. I knew that. Sorry, temporary brain malfunction!!!! Look at the time of my post. I was up early for a dental appt. I’m worthless in the morning too. The sun is still rising in the east for another day at least. With Ratigan gone from MSNBC, the best econ stuff that I’ve seen has been at RealNewsNetwork. Ratigan’s departure really left a gap in media analysis and educating the public. Ed Schultz has done some great reporting trying to explain the meaning of big numbers, but there is still a real gap in economic coverage in the US, so here’s hoping Hayes can help fill it. Hope to see Yves as a guest; she’s been very informative on RNN, Moyers, and RT. Fractions of pennies on the dollar! I’m sure it sounds fair or reasonable if you’re a bankster or an OCC “regulator.” How can these people live with themselves? Oh, I forgot… zombies are running the show. Arthur, you must learn everything you can about this issue before you even see a lawyer. A great number claim ignorance and wish to see you fail and the judges go right along with it. The good lawyers are fighting these cases and still losing to corrupt courts. I live in NJ also. Have you received something from the IFR stating that you will or will not receive a reimbursement? No I will receive something but in that final frame work must people will get $300.00 -$500.00 and there is no mention of credit repair. plus this is no kind of money for the damages bank of america did to me and my wife. we lost a $205,000 home where lived for 7 years. I had a medical hardship and they would not even give me a foreberance for the one month that I got behind while waiting for the state disability check. They stole my home. They should pay everyone at lease $125,000. This is not fair our taxes bailed them out that we will be paying for and even our Grandchildren will be paying for their lies and deceit. saying I would get a check. HI ARTHUR HAVE YOU HEARD ANYTHING BOUT PPL COMIN OUT CAVRIS?? Didn’t Mary Schapiro of SEC fame (pardon, infamy) just land at Promontory when she got spit out of the revolving door? I wish I could say I smell a rat, but how can you when everything smells like rats? Wonder how one would do the math to see how the review consultants made per case. A billion dollars at 300 to 1500 an hour would seem to indicate they reviewed a lot files, but it seems they made the money doing nothing. I need a job like that. What about the monies the banks are supposed to put out for making adjustments in mortgages they charged big fee’s, interest and other charges on? Is that still part of this. Or how about the idea fixing the credit reports and scores of those they screwed? I got a modification after at least 5 “trials” they messed up, but in doing so my mortgage went up $27,000.00 and my payments up over $100.00. Not to mention the credit slam. Hell, I didn’t even want to do a forbearance, Chase talked me into it and then took 3 years to get a modification that increased my mortgage. How about them reviewing crap like that? I bet more than 8-100 people. And not to even mention the probability that Chase never owned your note in the first place. Those pesky details. Susan, yea they actually did. I have a VA loan and went to VA for help. That was pretty much a waste also. I kept asking as did VA who this “investor” was. They gave me Fannie, Freddie, Annie (or some other MEA) then advised their files did not indicate the “investor.” I asked how they could get a refusal about the modification until payments caught up or at least so many made, by the investor, but not know who the investor was. Finally after contacting the MO AG, Senators, VA and others Chase came out and “regret the mistake and realized there was no investor, and they held the note.” But they still insisted on 6 payments before a modification was done. I made the payments, but apparently they didn’t count toward my mortgage but “additional fee’s” above the 27K they increased my mortgage by. But hey, they and the “independent reviewers” are making it right and “compensating” me maybe $300-$500 for the mistakes they made. Never mind it probably cost me 40K in fee’s interest and other monies. Well maybe. But just because it was a VA loan doesn’t mean Chase owned your mortgage. Remember Fannie and Freddie shuffled all their MBS through MERS quite willingly. And it is MERS that is now nullifying every single loan it ever touched, and maybe then some. Because the broken chain of title cannot be cured. The simple fact that a loan got sent to MERS is enough to nullify it. VA or otherwise. Without MERS none of this could have happened. MERS was merrily foreclosing as far back as ’04 when I first noticed the activity in my county picking up. I wondered who this “MERS” was. I should have been paying attention then. I had no clue that the mortgage industry had become a big joke and all the regulators and bankers were in on it. I admit that I was employed in the industry for years before MERS. This is the reason I am so passionate about this subject. This will take decades to sort out as millions of homes are sitting and rotting. The big builders can’t keep up with demand for NEW houses and guess who is proudly displayed on the paperwork. MERS. This happened to me almost exactly the same way!!! I did end up in a “trial Mod” for 6 months then another then another! !1 Then they sold my loan, who, didn’t honor the trial mod and demanded payment!! Then it was sold again!! So did ask for the review….I’ll get $300!!! I’m not sure what you can do beyond filing suit, assuming you can find an attorney who will take the case, and assuming you get a judge who doesn’t dismiss your claims out-of-hand, as judges tend to be biased towards the banks, and especially in non-judicial states, but……….. If your payments were not applied FIRST towards interest owed, then principal, and THEN any late fees, penalties, or other charges, Chase was in violation of your mortgage loan contract, assuming they used a standard Fannie/Freddie form (think they all do). Check your mortgage contract, if you can’t find it, it’s probably online at your county register of deeds. Or if they haven’t gone online yet, they have hard copies on file you can request. One of the clauses specifies how payments should be applied. The reason this is so important is because if payments are not first applied to interest and principal, then late fees and penalties will snowball because you never get caught up. Yves posted about the Wells Fargo case in bankruptcy court in Louisiana recently, affirmed on appeal, where Wells was fined $3 million for failing to rectify this practice, among other things, after being court-ordered to do so. Wells also was ordered to pay the borrower’s legal fees which had run well into the 6 figures after six years in court. Because banks have a habit of never paying penalties to borrowers, she also applied statutory interest until paid, which is generally a generous rate (8% in KY). Do a search here if you want to read about it, it was Judge Elizabeth Magner, and you can google the decision itself online: Michael Jones v. Wells Fargo, IIRC. Also, if Chase was applying your payments incorrectly, I guarantee, you were not an isolated case. It was probably standard practice. I’d contact my state AG again and let him know. He SHOULD follow up on it, but that doesn’t mean he will. Most of the state AG’s are brain dead (or obligated to campaign donors) when it comes to the foreclosure crisis. Definitely NOT an isolated event. Same happened to me and Chase admitted shaving off penalties and late fees from my newly increased payments, thereby bringing remaining payment down below monthly amount due. They don’t accept “partial payments.” The AG in Louisiana is definitly brain dead and no help at all. Stan, JPMorganChase told Ted and I that they would send us our lowered payment plan after they resolved the missing payment from the HAMP program and they never mentioned anything about an interest payment from us until after they sent us a letter informing us that they had found their error, and then they put us on another program and raised our interest rates and told us we needed to pay the $27,000.00 up front or lose our home. A couple of weeks ago they tried to steal another property of ours that has no leans on it and has never had a lien on it. The title company told them there has never been a lien on it and told them they would not sign it over to them so JPMorganChase have now filed with the court to have the court give it to them. JPMorgan does not have a lien on this second property they are coveting. It is pure theft and the federal government hasn’t stopped them. The Missouri AG said he knew of one other case in Missouri where JPMorgan tried to steal a second property, the AG has ask us to call him this week and we will learn of their actions if any of this crime. From the above post re Gene Ludwig, former Comptroller of the OCC. Upon leaving the OCC he started a financial services firm that, among other things, “splits up companies’ large bank deposits into multiple 250K$ chunks so the FDIC will insure the cash…” And the latest info seeping out of the FDIC is the proposed possibility that the fund will not have the money to cover a crashed depositary containing all these customized deposits and so it is looking at bail-ins by savers just like Cyprus. It was absurd to allow the depositary to hold this stuff in the first place. Did that happen under Ludwig too? No matter – the OCC is rotten to the core. Shut it down now. Rotten to the core indeed. I helped a friend with a compaint to the OOC. The joke was on us. The FDIC is also insuring derivatives held by the banks now, too. And because of the way seniority works, depositors are considered creditors, the derivatives have seniority over deposits. Bank of America was reported to have $175B of derivatives they moved from Merrill Lynch to their depository institution about a year or two ago, at the insistence of the investors. IIRC, Sheila Bair wasn’t going to approve the transfer but was overruled by the Fed. If we have another GFC, will there be any money left at FDIC to pay out to depositors after covering losses on derivatives at TBTF banks? SCOTUS ruled though that the FDIC can’t run out of money, it’s backstopped by the Treasury. Scary, eh? I wanna hear that famous question from the McCarthy HUAC hearings,how’s it go? “At long last, man, have you no sense of decency?? ?” Something like that. Also, a simple “What the f#@k?” paired with a withering stare would be good. It would need to be all intense and dramatic, pausing after each word for emphasis, perhaps while clenching the settlement agreement in one hand. “What…The…F#@k?” That would be some good teevee. Well it did accomplish at least one thing. It greatly enriched the consultants…a monster payday. Yves, it seems that either the consultants got a “monster payday” or used a good part of that money to fund a cover-up. If the indications of document fabrication are true (as described in your report), then a good part of what the consultants were paid may have been directed to fabricate/re-fabricate documents to cover-up problems in the records. Suspicions of such a cover-up probably wouldn’t be credible if not for HAMP (“paving the runway”), robo-signing, and other bad faith/bad behavior that we have witnessed. But if the document record was “fixed” then they wouldn’t need one quite so much, would they? Did anyone else notice that an entire category has been eliminated from the final payout schedule? Now, on the new schedule, no such category exists. I think we can all agree that most foreclosure cases lacked standing, perhaps as many as 85% of them. BOA in my case certainly lacked standing (and thankfully I noticed and beat them)…and of nearly 1000 cases I’ve personally reviewed, almost all of the plaintiffs lacked standing. Now, after a three year battle, all we get is a measley $300?? What about all the people who didn’t realize the bank didn’t have standing, didn’t defend their cases, and lost their homes?? This is such a huge slap in the face. Yes indeed JL. Will you please repeat that one more time so it starts to sink in. That is the category that I fell into. Until I received my postcard and looked into the catagories, I wasn’t ware that the bank should have done things differently. We were not in default until I contacted Aurora to tell them that we had used up our savings to make payments while my husband was unemployed, and would likely start falling behind. Should we move? What was the next step? They advised us to go ahead and move, try to short-sell, and then let them know when they could come and secure the unit. We were current the first month that we had moved out of the place and then went into default after we had already moved. Horrible advise in hindsite, but because I wasn’t aware that there were other options, or this wasn’t the way things were suppose to work, I never requested a review. If it was going to result in losing our house, anyway, maybe I should be glad that I did not invest in a futile fight to save it, but still. Pretty sure that we’ll be in that $300 category as well. I visited the link to huffpo and was greatly encouraged by the comments. People are really starting to get what a scam this has been. I remember a couple of years ago it was all about the scams the homeowners pulled on the banks, at last the truth is reaching the public. Bravo. The amounts vary significantly from the first matrix released last year. What a complete and utter joke! The last matrix indicated I was in line for either $5000 or $15,000. If I understand this one right, it is now $500….and quite possibly zero. $500 does not even make up for all the time I had to spend locating organizing, and responding to the IFR…let alone the court fees and modification morass the banks completely bungled. Great job OCC and Fed! You guys really know what you are doing…keep feeding the mullah to the banker boys and “consultants” and to the hell with their victims! So the banks didn’t like the findings of borrower harm, nor the costs associated with, the out of control, overly complex, and poorly managed IFR process. So they were allowed to do their own review of 4,000,000 loan files in an inconceivable two month time frame, and send out peanuts of their choice to borrowers per an inadequate schedule such as this? Nice work fellas. It’s as if the Servicers were not even looking at the same files as the B of A whistleblowers, if they were looking at loan files at all. One big mess, so just sweep it under the rug as soon as possible! Gotta protect the “clients” from financial ruin you know! I think questions should focus on the servicing software. In particular in order for “business records” evidence to be admissible in court, it must have been made “at or near the time by someone with the knowledge” and “the method of preparation [must not] indicate a lack of trustworthiness.” Fed Rules of Evidence Rule 803(6). From your research it is clear that the LPS platform that is used by most (all?) servicers is not designed to produce trustworthy business records that are admissible in court. In particular, it appears to be easy for anyone to enter data into it, and the tracking of accuracy (who, when and why) of data entry appears to be extraordinarily faulty — arguably with the purpose of creating false records in order to submit them as evidence in court. I think the servicers should be hit extremely hard on this point and that Congress should start defining criteria that software must meet in order for business records kept using that software to be admissible in court. A while back, Yves and others discussed the class action suit City of St. Clair Shores General Employees’ Retirement System v. Lender Processing Services, Inc. (LPS), et. al. My understanding is that this case was recently settled for an undisclosed amount. But it would be great if someone-who-cares took a deeper look into this one. Thanks for the link. That complaint was dismissed without prejudice and they refiled a second amended complaint May 2012. I haven’t continued searching for later updates yet. I haven’t finished reading the amended complaint yet, the second amended complaint from May 2012, but it’s turning out to be even comical in places. LPS has processed about 50% of the nation’s foreclosures through their attorney network. This is a class action suit by investors, a pension plan who purchased stock in LPS, and is alleging they were misled as to nature and legitimacy/legality (undisclosed that illegal attorney fee-splitting was primary source of revenues) of business and that officers knew it was unsustainable and would crash. The plaintiffs have managed to find a large group (so far at least 19) of former employees as confidential witnesses to describe standard practices at LPS. Among other things, the confidential witnesses allege that LPS was fabricating documents. For example, they’d ask the servicer for an assignment of mortgage if it was missing. If the servicer was unable to locate it, no problem. For a fee of course, they’d be happy to enter the unverified information they had (why bother confirming accuracy of information, these are borrowers, let them complain, see if anybody cares) into their software, and generate the necessary assignment. The assignment would then be sent to the signing dept, to be signed by a robosigner representing to be the necessary party. To ensure that certain info was included on the assignments, they had placeholders. A couple placeholders, rather important ones for an assignment, were labelled with “bogus assignor” and “bogus assignee” to remind staff to input the info. The maturity date for a loan, by default, was 99/99/99. Sometimes, in the pressure cooker to produce volume over quality, fabricators would forget to overwrite these placeholders. Or signature lines were notarized but remained unsigned. The documents then would go out to county clerks to be filed. However, when CW8 brought this issue to the attention of higher-ups, such as Gaglione and Brown, they instructed him to just send out the documents even with these discrepancies, and that he should only worry about it if the documents were returned. The other item of interest, not really news except that it comes from a large servicer, AHMSI, who alleges that LPS/DOCX creating the assignments that transferred mortgages into trusts, to “memorialize” them, was initially concealed from them, and subsequently under-represented how common the practice was, affecting 30,000 of AHMSI loans in TX and other states……. and which had exposed AHMSI to a losses in the millions and a “myriad of legal issues”. The hyperlink to go with the quotes above sent my post into cyperspace, so I removed it. He is known by *salad order* ??!! Is this the latest Mark-of-the-Blob ? I quite agree that this is the mess we get when we “let the system happen” instead of pushing back and demanding our legal rights. So this is where you, credit card debtor and home “owner”, are. Stop talking about your “rights”, stop being surprised at the bad advise and lost documents, and start complaining to the local, state, and federal officials about your “rights”. You must push to get them back. will meet in OPEN SESSION to conduct a hearing entitled “Outsourcing Accountability? Examining the Role of Independent Consultants”. The witnesses on Panel I will be: Mr. Daniel P. Stipano, Deputy Chief Counsel, Office of the Comptroller of the Currency; and Mr. Richard M. Ashton, Deputy General Counsel, Board of Governors of the Federal Reserve System. The witnesses on Panel II will be: Mr. Konrad Alt, Managing Director, Promontory Financial Group, LLC; and Mr. James F. Flanagan, Leader, U.S. Financial Services Practice, Pricewaterhouse Coopers LLP. Additional witnesses may be added at a later date. So, the OCC and the Fed are sending their lawyers to the hearing. The lawyers can competently cover their butts but will they be familiar with the details of what happened with the IFR? The written testimony is up at the Senate Banking Committee Site. These hearings are usually webcast with audio, often video. Yes, the LPS system was ground zero as it relates to borrower harm. Check LPS shareholders at the height of the crisis, and you’ll find most had close ties to the Servicers, seeking to profit from the crisis they themselves had created. The grand design was to bring in foreclosure mill attorneys with favorable endorsements by the GSE’s that were needed to harness foreclosure volume. Allow those LPS network network attorneys to in many cases assess legal fee billings beyond statutory and GSE limitations, and use related third party vendors to provide routine non legal foreclose processing services at outrageous above market rates. The icing on the cake, was to then require that the attorneys bill it all to the borrower through the LPS software, to be rubber stamped by the conflicted servicer, betting on the ignorance of the American public to ever figure out or question the scheme and/or billings. Yes, the St Clairs Employees case spoke to the nature of the LPS business model, and they wanted it settled badly. So does anyone know how they are classifying the “foreclosure status”? Is it the status as of today? Because I completed 10 payments to B of A under the modification they offered me, but then they transferred my loan and the new servicer did not receive any of the paperwork from B of A, so they insisted I start over. I never did, and the home was foreclosed. I believe I should still fall under the “failed to convert to permanent modification after completing 3 payments” category. Anyone know if loan is a MERS loan…any attorney that can defend a foreclosure still in process in Califoria? I would love to see 4 million people march to the white house against this like the people did at The President’s inauguration. Wouldn’t that be great? The only thing is they would probably spend 3.8 billion to have us all arrested. And still no jail time for the bankers and the OCC. so are we saying that if you filed banruptcy at the time of your foreclosure you were protected by bankruptcy law also bankrupt individuals have a cretain amount of payments sent in their behalf by the banruptcy lawers, and then they are still foreclosed on!!!!!!! so thats the payment 62,500 i will take that it’s better than nothing and right now i got nothing. Yes, I believe so. The judge orders a stay on the foreclosure while you are making payments under your court-ordered plan. The lender may not charge any additional fees without court approval or foreclose while you are paying under your bankruptcy plan. At the time the plan is initiated, you become considered current on all debts. You also finish the bankruptcy plan as current (assuming you’ve made your payments as ordered). Disclaimer: I am not a real attorney. My license to practice law was ordered off a box of Frosted Flakes, my real degrees are in nursing and computer science (kinda related????). Thus, you might not want to consider the above to be real legal advice. The Cease and Desist orders stated the servicers were to do their own review of the foreclosures (theft) and theft sales that occurred within the time frame, January 1, 2009 through December 31, 2010. Now people who filed for a foreclosure review are being rewarded for being defrauded when those that don’t trust the system after being robbed and defrauded are being punished even further for not entering into yet another contract? Ridiculous! I saw the foreclosure review form, it was written by an attorney. There were lots of legal terms in it. It had some bar coding on it of a purpose that was undisclosed. I didn’t trust the form nor the handling of the review process. The foreclosure review form stated ‘You lost your home…’. No. I didn’t lose anything. I know where my home is. Someone else is living in it now, because my home was stolen, declared abandoned when I was forced to leave it, and sold to someone who wanted unjust enrichment of a great home at a great location for a low price. How am I going to fill out a legal document that is deceptively stating a list claims and they are not my claim? It stated ‘Your servicer…(etc)” No. The business that stole my home was NOT my servicer. Their substitute trustee posted the notice of sale before they filed to be the substitute trustee. So I am not going to fill out a document that asks me to identify with a business as if we had a business relationship when there was none. I am not going to blindly select the least wrong answer to indicate what was done to me that others are calling ‘a mistake’. The entire remedy is worthless and worth less. If someone can take the $300 or $800 and put it down on another home and move in, then maybe. After years of life energy labor to pay for property that was stolen, and all the sweat equity in upkeep and lawn care, and all of the intangible experiences, neighbor relationships, and other living experience that were stolen; the best payment when it is assessed as to the financial harm done to the people who’s right to property was thwarted along with emotional and psychological harm is $300? This is not a true settlement nor remedy. Next time read your own Cease and Desist docs before you punish someone for not filing out a review form that your Cease and Desist documents clearly indicated the burden of determining the damage laid squarely on the shoulders of the servicers that did the damage, not on the people to pander to them to look over the paperwork to see if they were harmed. No one HAD to fill out a review form, but the servicers HAD to review their files. You have discriminated against the people harmed. Discrimination is also against the law, or is that another ‘mistake’? We crreated Laws to be followed. Americans Against Foreclosures say arrest all the Banksters and Judges that have permitted this to happen. I called Rust back in February to see if my loan fell under one of ‘the categories’. The rep told me ‘yes’ your laoan qualifies. I informed her i had moved six times since my foreclosure and requested she update my address. She told me a notice from Rust would be mailed by end of March. On March 25, i called Rust as I had not received infamous post card. Rep told me it been mailed and gave me the address. I told her that I had never lived at the address where post card was sent and that i had. Alled one month prior and had updated my address. She claimed in fact there was a note about my call but their ‘Procedure’ for address changes had been updated. She instructed me to send a written request with all my information, and specifically indicate i wanted an ‘Address change’. I sent in request via registered mail. My tracking receipt shows Rust signed/received my request on 3/29/13. I called Rust on 4/2/13, rep told me they had not received my request to call back in a week. On 4/8/13 I called and rep stated they had changed procedure and now they would send me ‘address change form’ which can take up to 3 weeks. I asked where did they get the address that they have in my file as I have never lived there? She could’nt answer me. So I thanked her for her help Nd hung up. I did some investigating in the phone book for the city I live in and found another person with same First & Last name as mine. Only difference was our middle name. To my shock this other person with same name, lived at the address Rust had as my address. So I called Rust back and told the rep what i had discovered. The rep put me on hold in order to ask a ‘Manager’ what can be done as compensation checks are going to be issued in a few days. To my surprise rep stated that there was nothing they could do. That even though they were going to send check to wrong person that most likely is going to cash it as it has theirname, I was going to have to prove that it had not been cashed/received by me. Pretty much was told ‘we will cross that bridge when we get to it’. I asked him if it was possible to put a stop/hold on check and he stated ‘no’. So not only did i loose my home, now I loose the little compensation im entitled to even though i informed them they were going to send compensation to wrong person? It’s so unfair! Another slap in the face! How can Rust do this? It would just take all of us to gather our documents, and paperwork we saved from this hell, and do our own review. The true numbers would show, when all of us show our phone bills representing all the lost time, and many attempts on our parts, our letters from the banks with their demands, or denials to our requests. The documents of torture, and fear. Being told that you will recieve that packet in the mail, and never receiving it, even after 20 phone calls. Bank statements showing payments $2-300 more than your initial mortgage, to see if you can afford their game. Bankruptcy documents if this applies to you. If we gather all of this, and submit it as a while group, they would have to rectify their wrongs! i will be down with that so that someone will represent me..cuz once i get thr chdck and send it …i will then kill myself..it is nit worth living anymore..we will never, rver matter. Wow what a farce! The least they could do is clarify exactly what category everyone falls into rather than leaving us guessing. So confusing. If foreclosure was initiated on me in mid 2010 and I filed Chapter 7 in Nov 2010 (discharged Feb ’11), and foreclosure ended in 2011, would that qualify me for $62,500? I did request a review. Why even get my hopes up, I’m sure it will be a silly $300 check or check will get lost in mail. It all goes back to the banks in the end anyways. I don’t see anywhere on the payment chart which category you fall under if they initiated foreclosure while you were applying for a modification and waiting on a decision. Payments were not applied because they were deemed partial, even though I sent what I thought I owed. I didn’t know that I had been put in foreclosure and now owed thousands in legal fees. E borrowed thousands from family members to get reinstated while Bank of America kept over two thousand dollars in an account for refused payments for four months. The first letter that I originally received stated that entitlements will be made regardless of at least $842 or so. Even though that is a low amount of money to compensate anyone that has lost their homes to fraudalent actions. What happened to that? Will that stand in a court of law? Went from one amount to a severely decreasing amount. Again the banks get by. crooks. a natonwide lawsuit from all involved inthid mess should stand together & let the banksters understand we will not accept this and make the banks accountable and pay out hefty payout fees fines. Here’s a bigger question, since this is an open ended settlement, can another big law firm start a widespread lawsuit? It states that we have the right to alternative legal action on top of this “review” process. That means that a class action lawsuit is not forbidden, or waived as well, please correct me if I am wrong, as I am not a lawyer or attorney and this is just an assumption. Why don’t we challenge these wolves in sheeps’ clothing? Why don’t we make them correct their exact wrongs, and pull together all our copies of denial, and lingering anguish, put all of our papers together, all of our own documents, because you know the banks didn’t record it correctly, therefore, the paperwork reviewed there is incorrect!!! This is why you should always keep records, and receipts, just a thought! There is already a persuing lawsuit against this Review itself, due to them keeping banks “Trading secrets” also known as documents of illegal activity to gain asset, a secret, and not revealing these documents to the borrowers and their representatives. I would liie to know as well. Ito am in the same shape as the rest of you.I was with emc mortage and they sold out to chase.THEY FORECLOSED ON ME AND I HIRED AN ATTORNEY TO HELP ME FIGHT TO KEEP MY HOME WHERE I RAISED MY FAMILY AND HE SOLD ME OUT TO THEIR ATTORNEY AFTER HE TOOK MY MONEY.I CONTACTED MY SEN. MY CONGRESSMAN,THE HOUSE OF REPRESENTATIVES EVEN THE PRESIDENT.NO ONE WOULD HELP ME.I OFFERED THIS BUNCH OF CROOKS MORE MONEY THAN IT WAS WORTH AND CHASE REFUSED.MY HOME SOLD AT THE COUNTY COURT HOUSE.MY SON TRIED TO BUY IT BACK BUT CHASE WOULD NOT LET HIM.SO AT THE AGE OF 61 I HAD TO GET OUT AND FIND ANOTHER PLACE TO LIVE.THIS CAUSED ME A LOT MEDICAL PROBLEMS AS WELL AS HEARTACHES.THEY WANTED ME TO PAY 227000.00 ON A 1982 HOME AND IT SOLD FOR 39000.00.SO AS FAR AS POLITICIANS HELPING OUT OR LOOKING OUT FOR OUR WELFARE I DONT TRUST ANY OF THEM.THEY ONLY CARE ABOUT THEM SELVES.IT IS TIME THAT SOMEBODY IN WASHINGTON GROWS A BACKBONE AND STANDS UP FOR US AMERICANS.IT WOULD BE NICE IF THEY HAD TO WORRY ABOUT LOSING THEIR HOMES. does rescinded mean something different for different states? i cant take this…3 yr wait for 300.00. why did they bother. my life is over! Today I received my payment for three years of hell fighting wells Fargo, culminating in losing my home and moving with my five children. My “settlement”? $500. Who can I contact to fight this?? According to the chart, we were entitled to $50k. I am interested in a lawsuit. Can anyone give me info? Kate, can you share why you received $6000? I filed for bankruptcy and then foreclosure in 2010. I just wonder if my case falls in the bankruptcy protection law. I received my check of $300.00 today. I just want to reiterate that I never knew about the Independent Foreclosure Review and did NOT receive any paperwork as I am sure most people did not either. This is a joke. Monica and Debbie: Yep, it’s a total joke. I was hands down in the $15,000 bracket of “foreclosed on while not in default”. And no, it was not just my emotional interpretation of the facts. It was confirmed in a court of law – I countersued and won. Guess BOA didn’t want to acknowledge that one, huh? But, of course, like many others, what did I get in the mail this week? $500. And yes, I responded immediately to the review. I had to be one of the few that was actually reviewed. It’s like Joe Pesci said in Lethal Weapon II – “they F*CK you at the drive thru!” Well they did it to me the first visit and when I circled the building back around a second time to call them on their mistake, they just F*cked me at the drive thru again. We were entitled to 50K. And got $500. I’ve gone public and contacted every local politician and news outlet. I may never see another dime but my voice will be heard. SLAPPED TOO WITH A $500 CHECK ON MONDAY 4/22/13. A TOTAL OF SEVEN YEARS OF PURE HELL!! I’M FED UP. WHAT PENNSYLVANIA LAWYER OUT THERE WILL TAKE THIS ON? I LOST $850 FOR TO APPRAISALS TO REFINANCE (DENIED), LOST $1,000 TO MOVE OUT, THEN ANOTHER $1,000 TO MOVE BACK IN THE HOME, THEN ANOTHER $1,000 TO MOVE BACK OUT. PAID THE ELECTRIC ON THE PROPERTY EVEN THOUGH I WAS NOT LIVING THERE ($1,000), PAID A MOWING COMPANY TO MOW THE PROPERTY ($1,000), PAID THE WATER/SEWER BILL ($700), PAY THE FINE FOR NOT SHOVELING THE WALKS IN THE WINTER TIME ($500). LOST MY 20% DOWN THAT I PLACED ON THE HOUSE AT SETTLEMENT. LOST MY $5,000 I PUT DOWN ON THE HOUSE TO HOLD THE PROPERTY FOR US. PAID A LAWYER FOR SOME CONSULTATION FEES. ALL OF THIS ADDS UP TO WAY MORE THAN $500. NOT TO MENTION THE STRESS, MY CREDIT, ETC….! LOOKING FOR A CLASS ACTION SUIT IN PENNSYLVANIA…., COME ON LAWYERS. WE ARE ALL WAITING!!!!!!! Wells fargo denied me restructure after I explained I had renal failure and I needed to lower my payment due to medical bills. They told me not until I was 3 months in arrears would they consider it. So applying their reasoning I should mess my credit up trying to save my rating. they foreclosed anyway when I started to falter. My ex-husband got the check in the mail made out to both of us for four hundred dollars. I was the one fighting to keep that home from foreclosure and was told don’t send a partial payment, and no we don’t have your information only your ex husbands every time I called because of the change of hands of my mortgage company, and then told after sending the paperwork four different times I couldn’t get the modification. For all this they give me four hundred dollars which my ex took half of even though he did none of the work and endured none of the hell. My first mortgage company was Taylor Bean and Whitaker and their CEO is in jail right now, but they handed our loan to B of A who says they never got all of our info which included my info. I finally filed bankruptcy and had to let the house go because I just couldn’t do it anymore. So what now? What can I do to get the amount owed to me? got my check today and it was much less then I thought it was going to be, home was foreclosed on in 2009 same year i filed for chpt 7. Was with Wells Fargo and got only $400, how it that possible?? I received my check today after losing my house of 20 years> I made 10 consecutive payments, turned in the CITIMORTGAGE documents showing my payments. The foreclosure was completed and my check is far below the amount it should be. As a teacher, if you are going to use a rubric to assign a “grade” you should at least review all requirements prior to assigning that grade. No surprise to me, what a PATHETIC attempt to correct such a wrong!!! I would proof my post, but I am needed at my duty post where I would be fired if I behaved like those in charge of this process. happening. I would really like to know how Wells Fargo decided to give me $500 compensation for all this. I have such a story to tell out of massachusetts, a non-judicial forclosure state … meaning if the bank wants to put you through the ringer and forclose w/out efforts to modify- they can do this with little oversight and the only way to get to court is if the homeowner files $$$. I our case we’ve been fighting Webster Bank since 2007 and filed complaints w/the OCC for violations of federal and state laws for everything from a $500 late fee to putting us through no less than 5 modification processes without every responding to each package of financial information etc. The back-due amount has crept from 2400 dollars to, now, $6000 including fees etc. State AG can’t help b/c OCC supercedes them – so we turned to the OCC and filed multiple complaints – even sent a copy of the last letter to Tim Guietner (sp?) – we got letters back from the OCC’s CAG – each taking up to three months – saying “the bank says this” and “the banks says that” without consideration of the federal laws. The many laws broken include the law saying if state law doesn’t give a percentage, no bank can charge more than 5% of a monthly fee for a late charge – our “late charge” was an even $500 that showed up on a single statement and was added to the balance due. There is much more – but the OCC’s response, and again this is just on the $500 fee was that it was a contractual issue and the OCC is and administrative agency that does not review banks individual contracts. You. Are. On. Your. OWN. Each letter ended w/we suggest you hire a lawyer as the bank will foreclose on your house. They sent us a right to cure notice in January, and since then I’ve been sending RESPA and TILA requests for information – who owns the mortgage, what are the balances, why’d we get a 1098 in 2011 but not 2010 and 2013- why are they holding 13 thousand dollars in suspense… and so on. They don’t respond. The right to cure notice gives us till May 25th. They haven’t filed the actual foreclosure w/the county – they did file a soldier sailors back in 2010…. In MA we have to wait for the actual foreclosure filing before filing a TRO or injunction (something I’ll do myself) and we are still waiting. MEan time I’ve just put together about 20 pages of a narrative, w/laws cited and all supporting documents. All organized into several binders. One goes to CFPB, another goes to HUD and another goes to my senator (Elizabeth Warrent) and the last stays with me to take to a judge. I want to share this with press, but my other half is ashamed that we fell behind a payment in 2007 …. We will fight this to the end. Oh, did I mention we are 26 1/2 years into a 30 year mortgage? And the bank that services our loans is not the bank we took our loan out with in 1987…. this bank bought our small local bank and from that point on it;s been hell. Oh and that this bank – a regional bank- took a half billion in TARP – no other comparitive regional banks took anywhere near that, if at all…..
Four years of our lives wasted on fighting a predatory refinance from 2005. FRB footnote to Regulation Z says that upon mailing a notice to cancel (rescind), the lenders’ security interest (our home of 20 years) is automatically void, and the loan is rescinded. Yet, 8 months after our extended right to rescind was ignored by the servicer (and 4 months after we exercised our right to cease payment until the creditor takes action upon our notice), “lender”, and MERS, the servicer filed state complaint to foreclose the lender’s avoided mortgage; then 30 days later (on the exact same morning upon which we filed our appearance) the servicer’s attorney, posing as a “MERS Officer”, recorded an affidavit stating that MERS had negotiated and transferred the note and mortgage to the servicer on a backdate. The notary public is an employee of the attorney firm, and she did not specify the date upon which the “MERS Officer” stood before her. Funny, the “backdate” was the exact day upon which we sent written dispute to the servicer’s attorney’s debt-collection letter which stated that we owe a debt to the servicer and it would foreclose (on the lender’s void security interest??). We had also requested a history of account for the umpteenth time (we had been on a phone/letter tag merry-go-round since this refinance loan closed – the lender was not responding and the servicer was using delay tactics and mental manipulation to assure us that things were being looked into – unfortunately for us we did not realize that time was being tolled under TILA). TILA says that collection action upon disputed debt (and derogatory credit reporting of same) must cease until the debt is proven. Instead, the lender AND the servicer began reporting the debt SEPARATELY on our credit reports (double reporting!) setting off a domino effect – our other creditors relied on the reporting and lowered our credit limits while raising our interest rates. We filed Federal suit in 2009, and we could never find an affordable attorney to help(pro se). This year, it seems we have finally lost the case. All of our consumer rights were construed to favor the defendants – all of our pleadings were apparently ignored by the judge. We were made to file all of our evidence and the defendants were given credence based only on thier say-so. And now, the judge’s opinion (in granting the defendants’ summary judgement motions with prejudice due to procedural error on our part), attempts to additionally falsely accuse us of making a false statement (we alleged that we had exercised our extended right to rescind by sending written notice to the creditor – NOT a false statement at all per FRB notation to Reg Z – and we have return receipt). It seems like, if we attempt to appeal the unfair rulings in our case, and/or go for the civil rights violations which we believed have occurred during suit, we will be framed based on the biased opinions and orders. We can no longer fight, we have children to feed, a mortgage to pay, and no savings to back up on. We have bad credit now, cannot get a loan, have not used credit cards in over 3 years. In the end, the whole gameplan seems to be delay until the homeowner can’t fight, and/or if it gets hot, turn the tables and make sure that the homeowner looks like the criminal. It is disgusting that, from 2008 to 2013, the defendants’ attorneys have already filed so many altered documents in both our Fed case and the servicer’s foreclosure case (which the judges have accepted as “evidence” without batting an eyelash, it seems). If one looks at our Illinois fedcase(pacer)2009cv02115,partynameArriaga) one can see what we have been through. Now wefearforourlives, literally. We got no money at closing, either – in fact, we had to submit a money order for the shortfall at closing. On top of it all, a recent partial history sent by the servicer shows that the “loan” was settled and paid (for way more than the original note amount), by an unknown entity in 2010 (yes, during the pendency of the cases). Shortly thereafter, we were sent a letter from the servicer stating that MERS is still the mortgagee (?? ), and the account was now being serviced for a secondary market investor-Fannie Mae, who has since ignored our letters and has not reponded in writing to date. Why would the GSE purchase it? Why won’t the judge allow us to add the GSE (our filings to add the GSE has been “lost”, TWICE, by the Fedcourt clerk)? Why hasn’t the GSE joined itself to the cases? Also, we have discovered that, to date, the two mortgages which were supposed to have been satisfied with the refinance are still on title and no releases had ever been recorded by the previous mortgagees. I am very depressed, been sick over it all – what happened to the laws that were supposed to protect us, why are the courts twisting the laws, and also twisting our words? This is entirely scandalous. More of an insult than getting nothing at all in many cases. Should I dismiss the 10’s of 1000’s I placed as a down payment? The distress caused to my children? The creature who showed up at my home and told my 4 kids that he now owned our home? And would be returning with ‘the cops’?